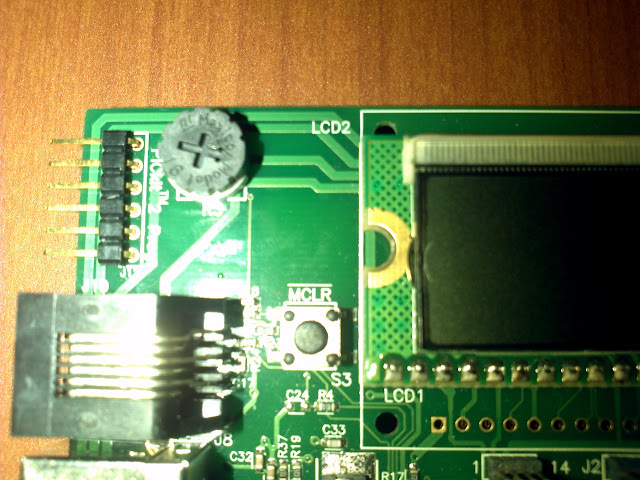 We will write a program that will read the voltage at the potentiometer and we will display that voltage using the LEDs in port D.
The potentiometer is the wheel to the left of the LCD, it is connected to RA0. 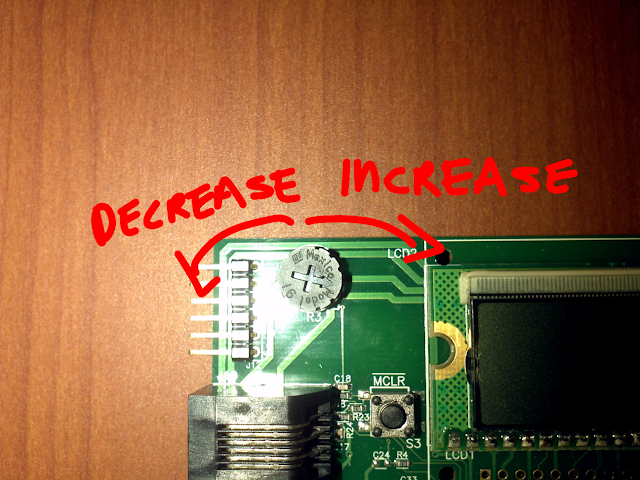 Turning the potentiometer to the right increases the voltage at RA0, turning it left decreases the voltage. If all the bits are 1 we have the highest possible voltage ( ideally 5.0V) all bits zero will mean 0.0V (ideally). any other binary number in between is a voltage between 0V and 5V. Since the pot is located at port A we will make port A an input; port D will be an output. There are three bit sets you need to configure ADCON0, ADCON1 and ADCON2, each bit set has eight bits. The first two most significant bits (from left to write) are unimplemented so we can leave them as zeros. The next four let you choose the channel want to use, since the potentiometer is connected to AN0 we will make all the four bits zeros. The next bit let’s you start the analog to digital conversion, in other words when ever you give it a value of 1 it will start reading the voltage, we are not there yet so make a zero. You can read page 270 of the datasheet to see all the available options. Similarly for ADCON1 one we have (from left to right) the first two bits which are unimplemented. Check page 271 of the datasheet to see all options that are available. This is the last bit set we need to configure before we start the conversion. Next three bits are to set the time acquisition delay, there are several options (check page 272 of the datasheet) we want to go with 0 TAD so we have all zeros. Setting the GO_DONE bit of ADCON0 to 1 will start the conversion, GO_DONE will change to zero when the conversion is finished. The result of the conversion is store in ADRESH and ADRESL, most significant and least significant bits respectively. Putting everything together we end up with this program.